Like millions of Americans, my parents used to tune in on Tuesday evenings to watch a program entitled “Life Is Worth Living” – a television show that then-Bishop Fulton J. Sheen pioneered. 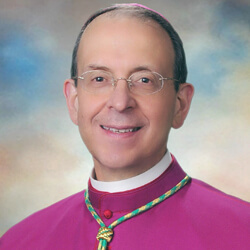 As a child, I watched the handsome Bishop in his cassock and purple cape with rapt attention as he explained the faith and the light it shed on the issues of the day. When my father was facing serious back problems, I wrote to Bishop Sheen. Within a few days, he sent back a lovely reply with a special note to me penned at the bottom. It had to do with my becoming a priest someday . . .
Long before he was on television, Fulton Sheen had a popular radio program. He was in demand as a speaker and was a very popular (and profound) professor of philosophy at Catholic University. He easily mingled with Presidents and celebrities. But he also knew and loved the poor. For many years he directed the Pontifical Mission Societies in the United States and made it a point to travel to some of the poorest and remotest places on earth. One author described Fulton Sheen as “a man for all media”. Long before the “new evangelization” he was communicating the Gospel to millions of people in a refreshing way using all the then-new tools of communication. Even now his talks are captivating and relevant. Undoubtedly a star, he never used his stardom for himself but only for the Gospel. He never took himself too seriously and always had a warm sense of humor. The key to understanding Fulton Sheen was his daily holy hour in the presence of the Blessed Sacrament. He once called it “the hour that makes my day.” By spending an hour a day in prayer, he was on intimate terms with Jesus Christ. As he grew older, his love for the Lord, for the Gospel, and for the Church continued to grow. If that was true for him, it should also be true for us. Just recently Pope Benedict XVI declared Archbishop Fulton John Sheen to be “Venerable.” This is the second step along the path to sainthood. May I ask that you pray each day for Archbishop Sheen’s beatification and canonization? In so many ways, he could be the patron saint of the New Evangelization as we seek in our times to welcome back Catholics who no longer practice their faith, reach out to those searching for truth and love, and work to bring Gospel values to our secular culture. May God bless you and keep you in his love!